Catch up on sleep, that is! Hey, gang! Wow, I am about ready to fall asleep on my keyboard here. I haven’t been sleeping much lately, and I do not do well on so little sleep. I’ve lost count of the meltdowns and freak-outs over nothing. I don’t have to get up early again until Monday, so I hope to get caught back up on sleep by then! 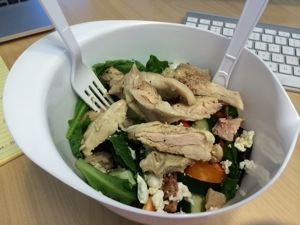 I put bacon in my lunch salad today. I needed it. It was like a delicious bacon hug. Along with greens, tomatoes, bell pepper, goat cheese, carrots, chicken, and olive oil. 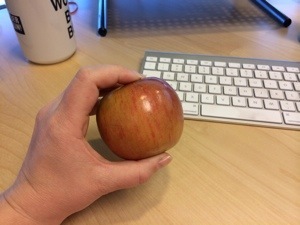 And an apple gor snack, with an unpictured packet of Justin’s Almond Butter. Man, I love that stuff. Hulk made a hamburger hash for dinner. I was too tired and distracted to take a pic, but it was delicious. The leftovers will probably make an appearance at lunch tomorrow. 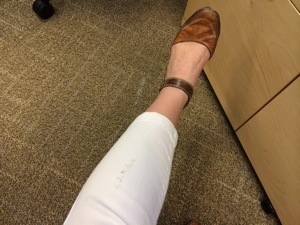 Note to self: stop wearing white pants when bike commuting. Anyway, that’s it for tonight. I think it’s bedtime now, although Mr. Squish doesn’t believe me. But I assure you, ’tis time.